Tuesday, May 29, 2012: It had never gone below 70 degrees all night. I checked radar and there was nothing close, and the forecast was for thunderstorms mainly after 5PM as a cold front approached. The high was forecast for 84 according to the Nat. Weather Svc. but it got up to the mid 90's. There wasn’t a cloud in the sky all morning, but a breeze came up. That helped, but I think I've got into my summer-hiking mode after three hot days. I didn't let the heat slow me down. An early start helps. It felt good to be on the trail early, even though it was already half an hour after sunrise: 6AM. I hiked south through a strange stretch of trail that many hikers might bypass to take the shorter direct route along the road. It skirts a corn field making a horseshoe shape that follows the Housatonic river much of the way. But the river isn’t very scenic here; and there were only one or two spots where you could really see it. 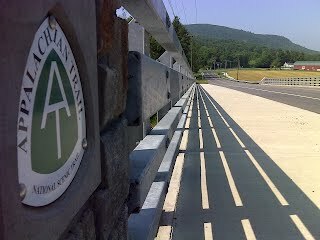 First was a road walk over a new 2010 bridge spanning the Housatonic, then a left turn off US 7 to Warren Turnpike, passing the Housatonic Valley Regional High School before diving back into the woods and following the strip of land between the turnpike and the railroad tracks. Then you cross the turnpike and cozy up to the river again, soon merging with a handicapped access loop trail. This trail is wheel chair compatible but has seen little maintenance for what seems like a decade. There’s big parking lot where this section of trail ends on Water Street, Falls Village. 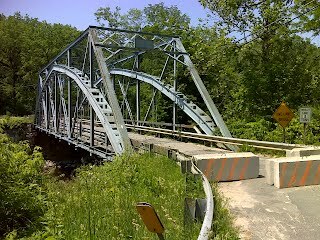 That street is closed to traffic at the Iron Bridge over the Housatonic – a very old bridge that has been deteriorating. The concrete barriers were probably put up within the past year. But the trail still crosses the bridge, then dives back into the woods to parallel Housatonic River Road and eventually returning to it for a short stretch of road walk before diving back into the woods at a maze of trails providing access to the impressive Great Falls of the Housatonic. I turned around where the trail crosses Housatonic River Road near the parking area for the falls and returned to the US 7 parking area about noon and got out the laptop again to check radar. Then I headed out to do some scouting and accomplish a couple of chores. I found the post office in Falls Village and mailed the checks and bills then found a gas station at South Canaan and bought a new supply of ice. Then I moved on to the parking area at Great Falls on Housatonic River Road and hiked a leg north, intending to go only 1.5 miles, which should have put me a mile short of Prospect Mountain’s summit and viewpoint. But there must be a one mile error in the distances, because that took me to the summit. Furthermore, I missed the little slot view from a bare bedrock vantage point because I was more focused on finding the trail, which lacked any white blazes at all through this critical area. I had already decided to hike ‘on to the summit of Prospect Mountain’, not realizing I was there, and got increasingly consternated when the trail began to descend and then leveled off. Fortunately there’s a clear landmark just a half mile beyond the summit – the Limestone Spring Shelter side trail. So when I reached that signed junction, I finally realized where I was. The shelter itself is half a mile down a side trail, so I will visit it tomorrow. I turned around and headed back as thunder began rumbling pretty much right on schedule.